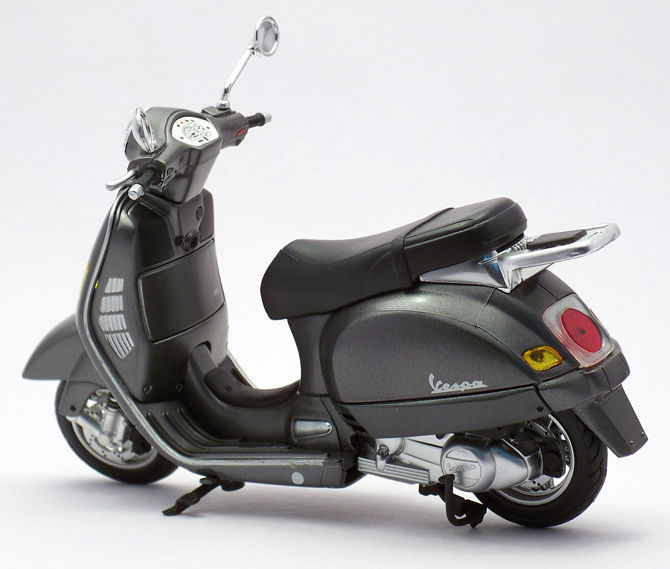 The Vespa was the first globally successful scooter manufactured by Piaggio. 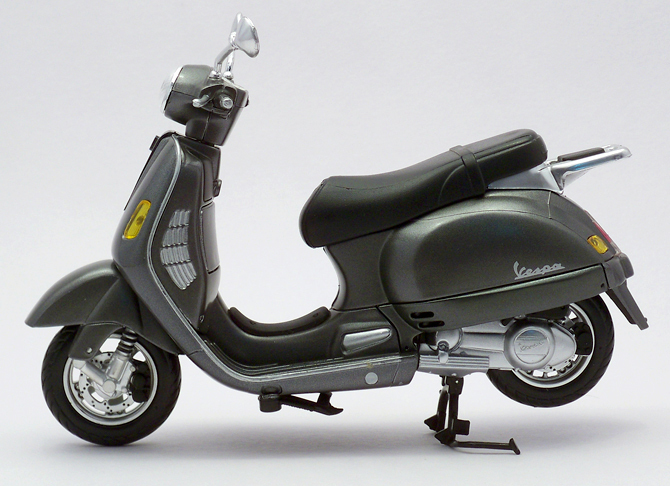 Vespa scooters have been known for their painted, pressed steel unibody which combines a complete cowling for the engine, a flat floorboard and a prominent front fairing. 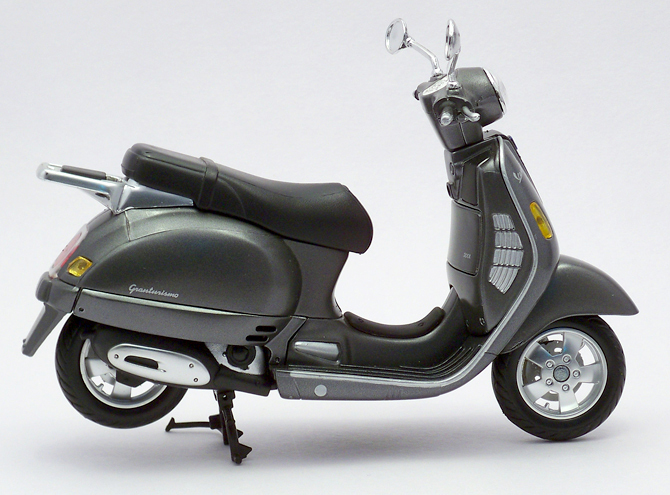 With its chrome mirrors and classic Vespa lines, the Granturismo is a thoroughly modern scooter true to its heritage. On the Granturismo you find the kinds of touches that have made Vespa world-famous: pressed steel monocoque chassis, 5-spoke die-cast alloy wheels, chrome retractable passenger footrests, and a classic floorboard design. 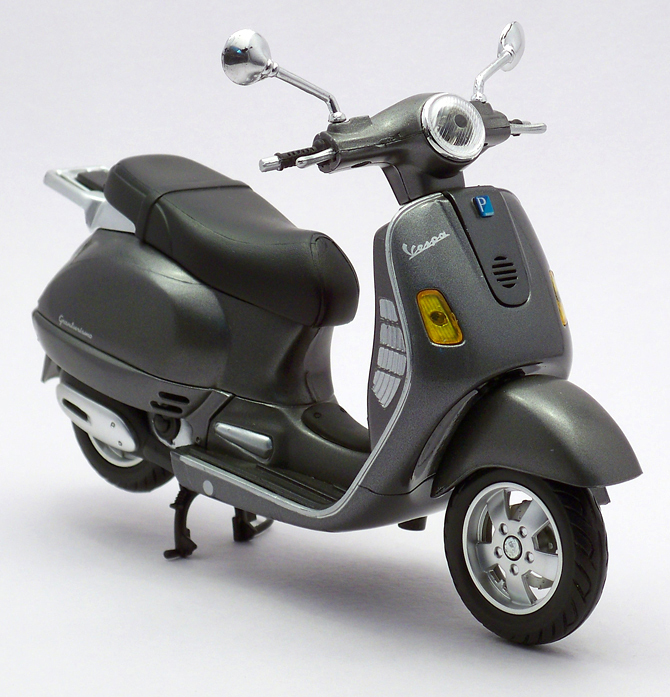 This particular model “Vespa Granturismo 200” is powered by a 200cc Single cylinder, four-stroke liquid-cooled engine produces 21hp of power. 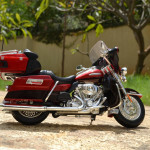 The transmission is automatic to pull away from almost any kind of traffic situation. Its exceptionally low levels of air and noise pollution well exceed the standards being considered in Europe and America made it a ideal city commuter. Bravo to NewRay for giving as all the privilege to have this marvelous model in our collection. 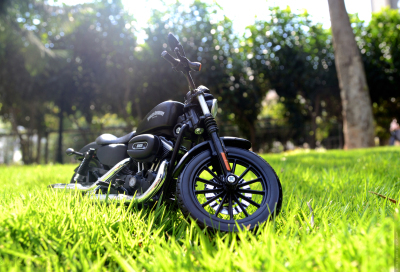 1:12 scale is very good to incorporate details which smaller scales aren’t sufficient to craft details like engine engraved ‘Vespa’ badge or drilled front and rear disc brakes. I picked up a charcoal gray but there were more color options available like supple green and bright purple. 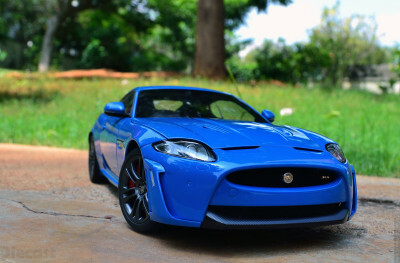 The body work is smooth and flowing and gaps are almost invisible. The ‘Vespa’ badge in the front, 200L badge in glove box, ‘Granturismo’ badge in the right side of the engine cover and another ‘Vespa’ badge in the left side of the engine cover are all greatly done. The Piaggio logo in the front is chunky and slightly oversized but holds some 3d styling to it. Addition of a license plate would be great! The instrument dial is boring as it is just a sticker which even is not detailed. 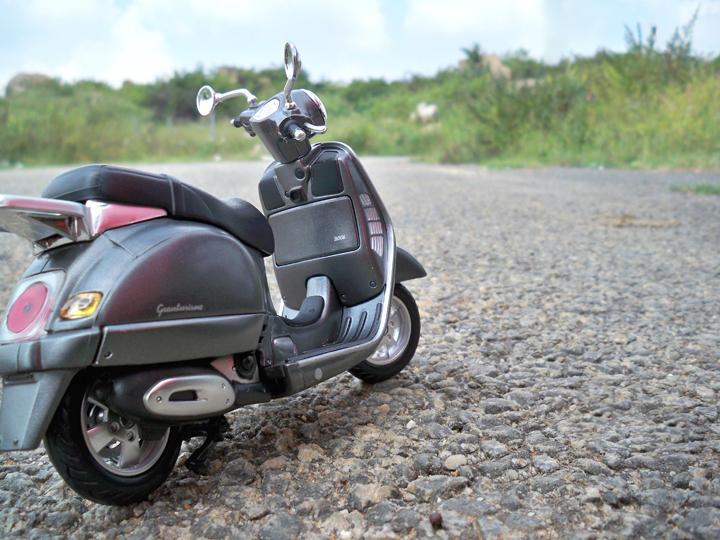 The Chrome rearview mirrors a class addition which increases the asthetic appeal of this Vespa by a couple of notches. Being a single side engined scooter the exhaust on the right side is the only bit relevant to the engine visible in this model but is very nice. The exposed five spoke alloy wheels are gorgeous and they also has an air filling nozzle. The front disc brakes and calipers a very realistic! The engine cowl has a engraved Vespa badge is a nice touch. 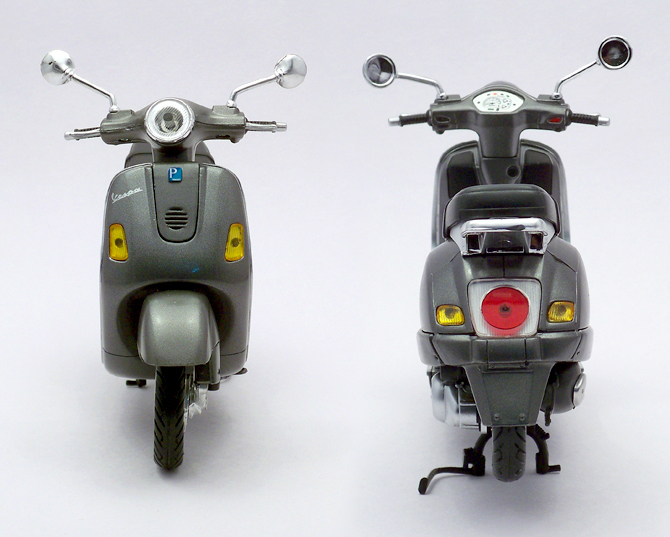 Both center stand and side stand are provided to aid more detailing touches and they work the magic of halting this scooter in conventional stance (center stand) of slightly sporty stance (side stand). Addition of a small black pad on the grab rail adds flare to the rear end. This being my first scooter I am very excited about even acquiring one. So this review is almost biased to one side (good fair side) which is good so the money well spend. One minor issue which I have is that scaling is not accurate as this looks a little oversized near my other superbikes.